An Emmy-award-winning journalist reveals how to ask the QUESTIONS that make a difference. What hidden skill links successful people in all walks of life? What helps them make smart decisions? The answer is surprisingly simple: They know how to ask the right questions at the right time. Questions help us break down barriers, discover secrets, solve puzzles, and imagine new ways of doing things. But few of us know how to question in a methodical way. Emmy-award-winning journalist and media expert Frank Sesno aims to change that with Ask More . 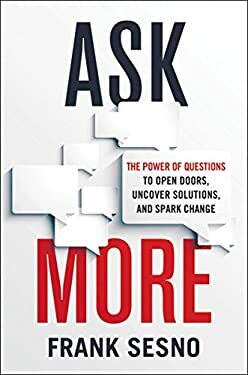 From questions that cement relationships, to those that help us plan for the future, each chapter in Ask More explores a different type of inquiry. By the end of the book, you'll know what to ask and when, what you should listen for, and what you can expect as the outcome. Packed with illuminating interviews, the book explains: - How the Gates Foundation used strategic question s to plan its battle against malaria - How turnaround expert Steve Miller uses diagnostic questions to get to the heart of a company's problems - How NPR's Terry Gross uses empathy questions to dig deeper - How journalist Anderson Cooper uses confrontational questions to hold people accountable - How creative questions animated a couple of techie dreamers to brainstorm Uber Both intriguing and inspiring, Ask More shows how questions convey interest, feed curiosity, and reveal answers that can change the course of both your professional and personal life.